A knowledge management system improves staff efficiency, customer satisfaction, and business service quality. 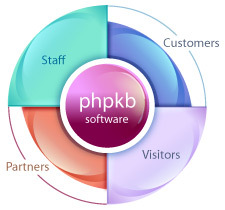 PHPKB knowledge base software provides a lot of benefits to your customers, as well as your employees. The benefits to you and your business are limited only by the use you make of knowledge management. PHPKB provides you with the opportunity to maximize these benefits. A well-organized knowledge management system improves staff efficiency, customer satisfaction, and business service quality. PHPKB knowledge base software provides the tools to harvest information from your most skilled, knowledgeable workers. It is a pathway that gets information and knowledge to your end users who need it to solve critical IT issues and to maintain their focus on the business. It includes ROI/metrics reporting tools to help you pinpoint information needs, validate solutions, and align your people, processes, and technology. A knowledge base is designed to organize and present your most common customer questions or problems and an explanation of how to solve them. A knowledge base usually stores troubleshooting information, how-to articles, user manuals, and answers to frequently asked questions. So, instead of answering the same question over and over, you can save time and money by directing customers to a online knowledge base before having them submit or open a ticket or call support directly. Do you know? A knowledge base can also keep customers updated with news, announcements, release information, and product updates. The knowledge base functionality gives a comprehensive, searchable database of common customer submitted issues and customer support requests and resolutions. The knowledge base is a self-serve service, meaning that it gives the customer the opportunity to solve their own issues easily while not engaging and tying up your technician’s time. Knowledge bases also include frequently asked questions. PHPKB knowledge base software has extensive customer side features, and that's why we (and our customers) think it is the best web-based knowledge base software available today. PHPKB Knowledge Base Software is an effective tool to cut IT costs without sacrificing customer service quality. It helps IT personnel meet the increasing challenge to stay informed on diverse, changing technologies. You can also reduce long calls and resolution cycles, and eliminate inconsistent or outdated resolutions. You can use PHPKB knowledge base software for both internal or external purposes. Reduce staff training time: You can use PHPKB knowledge base software to familiarize your new team members with product details so they can be up and running more quickly. Share documentation and procedures internally: You can of course use PHPKB knowledge base software for other knowledge sharing purposes internally. Reduce in-bound customer support requests: 80% customers are asking 20% questions! Most questions were asked before. PHPKB knowledge base software suggests (in real-time) similar already answered questions from your knowledge base to the customers when they are typing a support request thus helping them resolve issues in a self-help manner. Improve customer support quality and efficiency: Get it right at the first time. Giving an accurate and professional answer could be as simple as redirecting your customers to one of the knowledge base articles. With features such as Web-based self-help and automated knowledge base updates, your support staff can reduce call volume and escalation rates, accelerate resolution cycles, and lower your overall costs. Many customers actually prefer to be able to go into the knowledge base and learn what they need to know. It’s fast, easy, convenient, and it helps to keep the customer focused on problem solving versus complaining. The systematic methods of customization and the ability to provide adequate information to the customer makes the software twice as valuable. In order to provide top notch customer service you have to look beyond the interaction of trouble tickets and live chat. You need to take the time to develop your self help knowledge base. The typical knowledge base is growing and those who have relied on simplified FAQ sections are going to find that they are being outgrown. Any true knowledge base that is keeping up with the consumers of today will have to include some very specific and in depth information in order for the consumer to be able to simply help themselves. There is no help-desk software in the market today that has a professional knowledge base management system as good as PHPKB knowledge base software. When customers can easily find topical knowledge base issues, and be engaged reading KB articles that are organized and attractive, your support team will save time and money. Improve overall process efficiency by leveraging IT Infrastructure Library (ITIL) best-practice service management. For example, you can quickly and accurately provide answers, determine which content in the knowledge base is obsolete, identify information to be researched and added to the knowledge base, limit duplicate research, and help new hires get up to speed more quickly. With automated knowledge management, you can ensure the integrity of your database and more easily meet compliance standards. You also lower the risk of staff turnover by using PHPKB Knowledge Management Software to harvest and retain critical knowledge, even after subject-matter experts leave the organization. View our Online Demo to see how PHPKB can help you reduce your support workload & improve customer service.